ALBUQUERQUE, N.M. -- Marshall rose above the elevation in Saturday's Gildan New Mexico Bowl. The program stood tall in the shadow of the Sandia Mountains, which loom large -- as high as 10,678 feet -- to the east of the host city. In the end, the Thundering Herd put together a peak performance in front of an ESPN audience, using a pair of 100-yard rushers and a 100-yard receiver to out-offense one of the nation's top offenses, Colorado State, in a 31-28 win. The victory is Marshall's sixth consecutive bowl win and 11th in 12 bowl game trips. The Herd entered the opening day of bowl season as the winningest bowl team, by percentage, among FBS teams, and undefeated in bowl games under coach Doc Holliday. Those bowl traditions were protected after the Herd survived a two-touchdown rally by the Rams in the fourth quarter. But after quarterback Chase Litton hit tight end Ryan Yurachek for an 8-yard gain on third-and-5 in the twilight of the fourth quarter, Litton and the offense went into victory formation and the postgame celebration started at midfield. Equipment staff hurriedly passed out white bowl champions hats as Holliday and Yurachek smiled and hugged for an interview on ESPN. The team huddled on stage as junior receiver Tyre Brady and sophomore defensive lineman Channing Hames were honored as the Offensive MVP and Defensive MVP, respectively. "We went out there and played for the seniors," Brady said. "This shows what happens when you keep faith alive. Everybody doubted us and we came out and dominated both ends. The offense started us off and the defense won it in the end." Brady caught six passes for 165 yards and one touchdown, the third-most receiving yards in New Mexico Bowl history. Hames dominated defensively, leading the team in tackles, recording 1.5 sacks, 2.5 tackles for a loss and two quarterback hurries. But while they were the MVPs, others starred on national television. Marshall junior running back Keion Davis established a new career high with 141 rushing yards on 18 carries, including a 68-yard touchdown that was the longest run of his career. Fellow running back Tyler King, a freshman, only carried six times, but covered 106 yards and scored on a 90-yard run that equaled the school record for the longest rush. Overall, the Herd outgained the nation's No. 10 offense 501-390, distributing its yardage almost equally between the passing game (262) and run game (239). Defensively, Marshall sacked the Rams five times, even though CSU entered the game having allowed only eight sacks in 12 games. 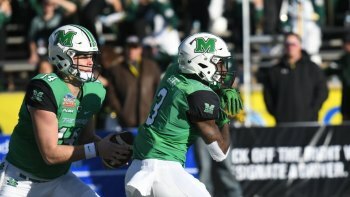 Marshall and Colorado State scored on five consecutive possessions in the second quarter, and then the Herd took over in the third quarter for good. MU's defense held the potent Rams offense scoreless in the third quarter, with all three CSU drives ending in a punt (15 total plays for 40 combined yards). Meanwhile, the Herd offense stayed in rhythm from the second quarter, first receiving a record-breaking run by King, who zigged and zagged his way to a 90-yard touchdown run with 12:12 left of the third quarter. King's run put the Herd up 28-14, and set a New Mexico Bowl record by 13 yards. Colorado State entered Saturday's bowl game with the high-powered offense in FBS, but it was Marshall that struck first. Litton dropped a perfect ball into the arms of Brady, who raced down the left sideline for a 76-yard touchdown on the fourth play of the second quarter (the first play of the drive for MU). The touchdown connection is tied for the third-longest in New Mexico Bowl history, and gave the Herd a 7-0 lead with 14:29 left. The pass was the longest for Litton this season, and the longest reception of Brady's career. The Rams answered on the ensuing drive, as quarterback Nick Stevens engineered a lengthy 15-play, 75-yard touchdown drive that chewed six minutes and 12 seconds off the clock. CSU tied it at 7-7 when Stevens, a senior, found Detrich Clark in the right flat for an easy 5-yard score. It did not take long for Marshall to answer. Litton found Yurachek, who earlier in the game extended his streak of consecutive games with a reception to 42 games (tying a school record), for a 15-yard touchdown with 6:07 left of the second quarter. The score gave Herd a 14-7 lead. The touchdown was set up by another long connection between Litton and Brady. Litton found the junior receiver between the hashes for a 47-yard gain to the CSU 18-yard line. Litton found Yurachek in the end zone two plays later. The scoring continued on Colorado State's next drive when Stevens found the middle of the field open and comfortably ran into the end zone for a touchdown to tie the game at 14-14 with 4:41 left of the second quarter. And as was the case the entire second quarter, Marshall had an answer on offense. On the second play of the ensuing drive, Davis found running room on the right side and broke free, then shook off tackles on his way into the end zone for a 68-yard touchdown run. It was the fifth-longest rush in New Mexico Bowl history. Davis' touchdown came 45 seconds after Colorado State's score, and gave the Herd a 21-14 advance it would carry into halftime. Marshall's largest lead came with 4:10 left of the third quarter when Kaare Vedvik booted a 21-yard field goal to make it 31-14. Colorado State, however, scored a pair of fourth quarter touchdowns to trim the deficit to 31-28. Stevens connected with Clark again, this time from 24 yards out, to make it 31-21 with 12:55 to go. Stevens added a touchdown in a quarterback sneak with 6:37 left to make it a 3-point game, and then the Herd defense made one last stand when the Rams had a chance to tie or take the lead to preserve the win. Marshall is now 5-0 in bowl games under Holliday.